Currently in its fifth year, this celebration of women’s surfing brings surfers from all over the Southeast. Not a contest, this gathering encourages women of all ages and abilities to participate in the sport of surfing, whether it is their first time to try it, or their 50th year of enjoyment of the sport. This year, the festivities kicked off with an original movie, “Connected to the Sea”, filmed and produced by Dr. Diana Wehrell-Grabowski. This film featured women surfers not only from Florida, but additionally Australia. 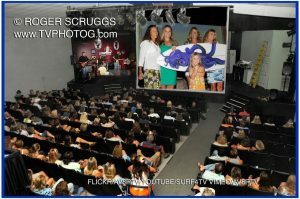 The movie was a rousing success in front of a record crowd of women and their supporters at the SurfSide Playhouse in Cocoa Beach. On Saturday, 11 October, the women gathered to enjoy the waves at Lori Wilson Park in Cocoa Beach, and spending time with friends old and new. 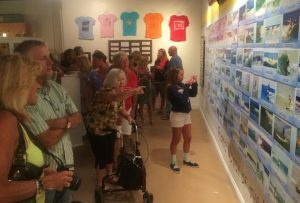 That evening, the Florida Women of the Waves Exhibit officially opened at the Cocoa Beach Surf Museum, hosted by the event founders Sharon Wolfe-Cranston and President Melody DeCarlo. This exhibit features surfing action shots of over a 100 women surfers, along with their biographies and personal insights and thoughts on their surfing journeys. The exhibit is an inspiration to anyone interested in surfing, and relays how the sport becomes more than a hobby, but a soulful, lifelong experience. Howdy – Sorry to send this so late, but my friend told me tonight about wow. Good for y’all. 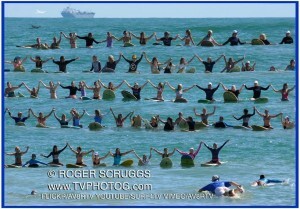 My friend is a woman surfer, who is now legally blind. Totally blind in one eye and 40% blind in the other. Apparently, she was trying to surf down the beach during a recent wow tourney, and was run over by a pro women surfer. Two of her three fins were cut off, she was done. No fault here. Her husband passed away about a month ago, AGENT ORANGE DEADLY BLOW FOR IN COUNTRY VIETNAM. 65 years old, healthy as a horney bull, the defoliant took him like a ten thousand hells. She plans to be at wow Friday, but no ride on Saturday. By now you probably know her name – Karen Lucas, Will Lucas’s widow. If someone would go aloha her, she’s tough, but breaks like a little girl. So sorry, for this late notice, but any act of kindness would be greatly appreciated. Hello Skip- Sorry I missed your message but our webpage is getting an overhaul and has a few bugs. We know Karen very well. She and Will have been involved in the museum for many years. It was sad that Will passed away. He was a great friend. We posted a memorium to him in our Kahunas column if you have not seen it please take a look. Thanks for contacting us.